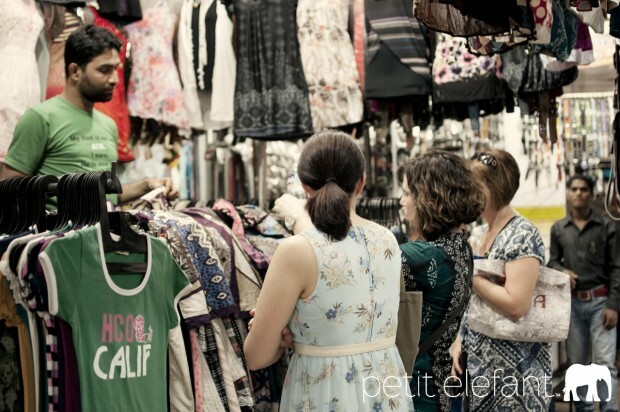 When I go to a new place, especially a new country, I’m fascinated by all the trinkets and souvenirs that my eyes behold. It’s like a little piece of culture that grabs my attention, because it’s usually different and unique to the place I’m visiting. 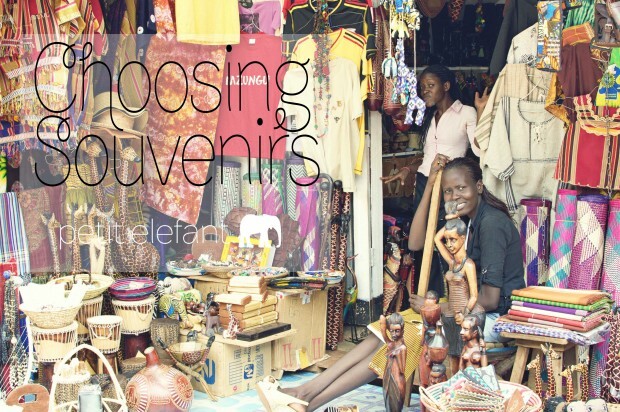 It’s easy to get caught up in the excitement of souvenir shopping and then get home, open your suitcase, and realize you brought home a whole lot of useless “stuff.” Over the years, I’ve refined my shopping so that I bring home purchases that don’t just add clutter but complement my home in beautiful ways. Check out my filters that help me do that. 1. Don’t sympathy buy. I travel to lots of places where poverty is evident. However, I refuse to be guilted into buying something, because I feel sorry for someone. If someone is selling a good product I like, then of course, I will be interested. That being said, if I meet someone that makes an impact on me in the short time that we converse, then a memento that will help me remember them is not a sympathy buy. It’s a way to ensure they never leave my heart. This has happened to me twice in Kenya. One was the granny with arthritic hands named Mary. 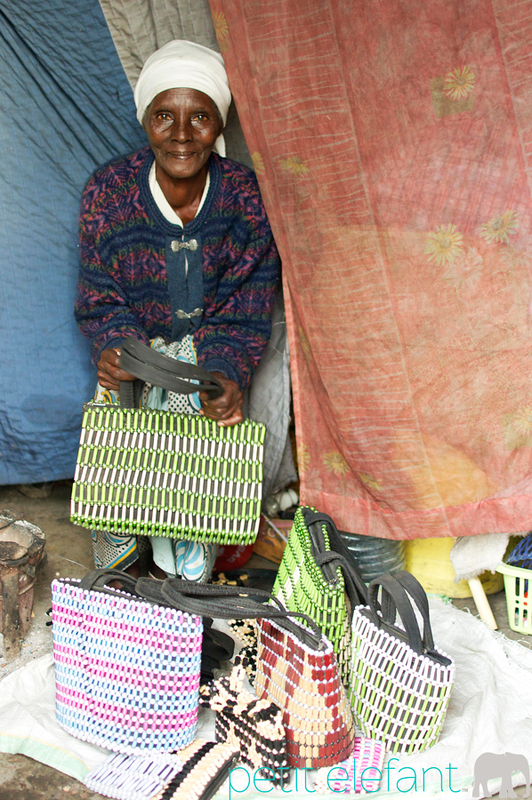 She hand-sews purses to make a living. She hardly had anything but gave my daughter a bag. She had the most beautiful spirit about her, and I never want to forget that. The other was the lady who lived at the dump, literally where all the trash goes. 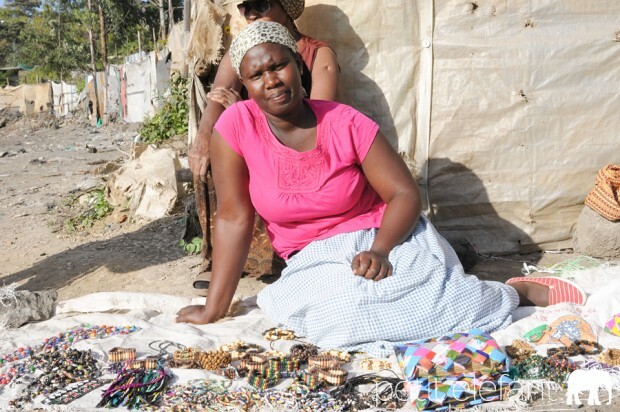 She made various items, some of them from recycled trash, to sell. She wasn’t looking for a handout even though her situation could warrant it. That kind of spirit is unforgettable, and the bracelet I bought from her reminds me of her. 2. Don’t be a cheapskate. I have to tell myself this, because I like to save money. That’s a good thing, but if my cheapness leads me to buy a small trinket (or several) as a souvenir to remember a place by, then I’m actually just wasting money, because I don’t like clutter, and to me, a whole lot of trinkets equal clutter. They may be cheaper than more meaningful pieces, but when I purge the trinket collection, then it’s a waste anyway. I’d rather not buy something cheap just to have a memento, and prefer to spend a bit more on something that I really like. 3. Find something unique. Every place seems to have their souvenir niche. In South Africa, it’s soapstone and beadwork. 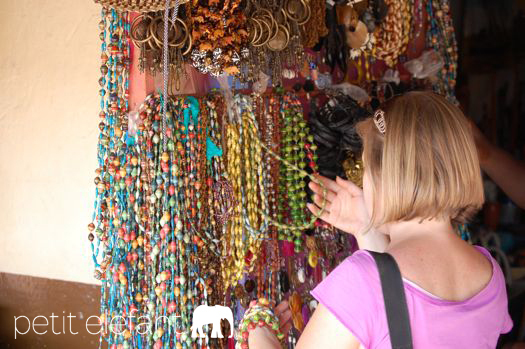 In Uganda, it’s paper beaded necklaces. It’s fun to get something native to the place, but also look for the unique items. My favorite unique item was the secondhand Thai dress I found in a market for about $12. It creates a beautiful wall hanging in my living room, AND it has character. I love it. 4. Answer the question, “Where would I put this in my house?” This question has helped me LOTS in buying items that will complement my style rather than on impulse. It’s also helped me have a variety of cool pieces from many different places that go together. 5. Find interesting food and/or cooking items. On my recent trip to Thailand, I bought coconut sugar, powdered coconut milk, and curry pastes. They were way cheaper than I could get them for, and they brought home the flavors that remind me of our trip. On another trip, I learned to make chapati in Kenya so I bought a chapati pan. Not only is it great at making this East Africa bread, but it also serves well to make tortillas! That’s the mental workings in my brain when I go souvenir shopping. What awesome tips do you have to share with us?